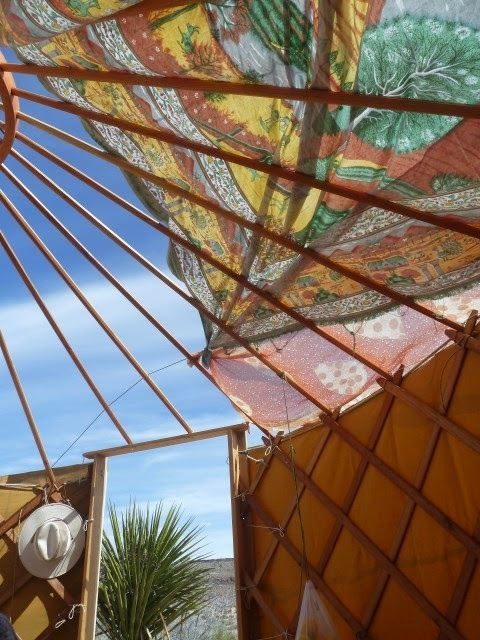 The ten foot yurt has had a few outings in the past few years. It worked well but I thought it could use a little more floor space in conditions where we wanted to use part of it as a kitchen. 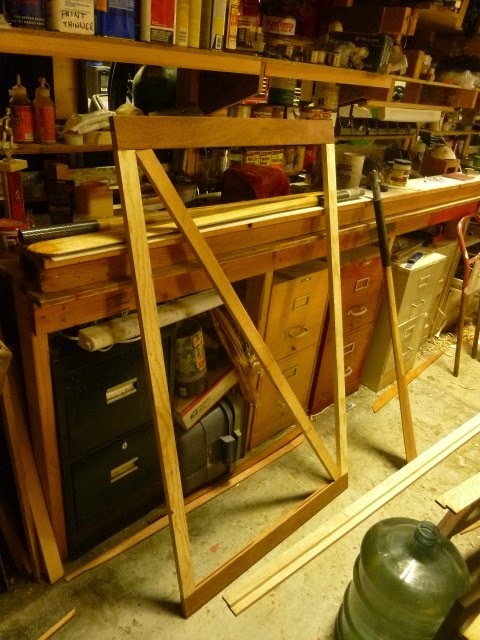 So I set to work on the design of a twelve foot version. 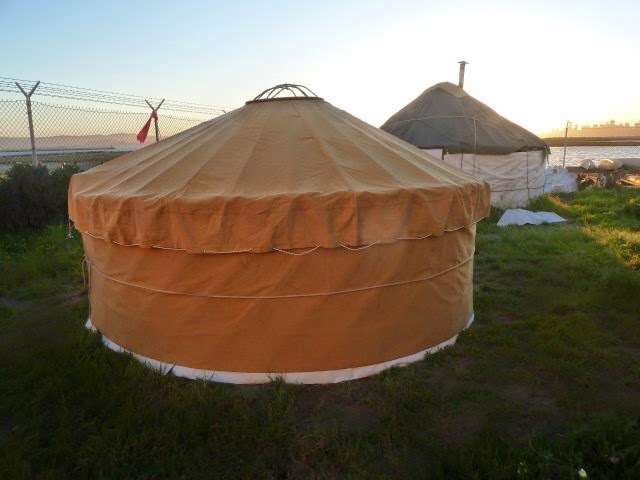 A twelve foot diameter, vs. a ten foot diameter would give this yurt 44 percent more floor space. I decided to keep wall height the same so that I could re-use the existing wall lattice, needing only to add another 6 foot section of wall to bring the circumference up to 37 feet from 31 feet. I tried to figure out ways to re-use the existing roof parts, but that was not possible. Still, re-using the existing wall parts and door cut down considerably on the total amount of work. So on to some pictures. Here's the sewing studio for the roof. I tried sewing the roof on the floor of the living room at first, but the large hunk of canvas kept colliding with various furniture. Having the large flat area of our driveway to rassle the canvas was a big plus. 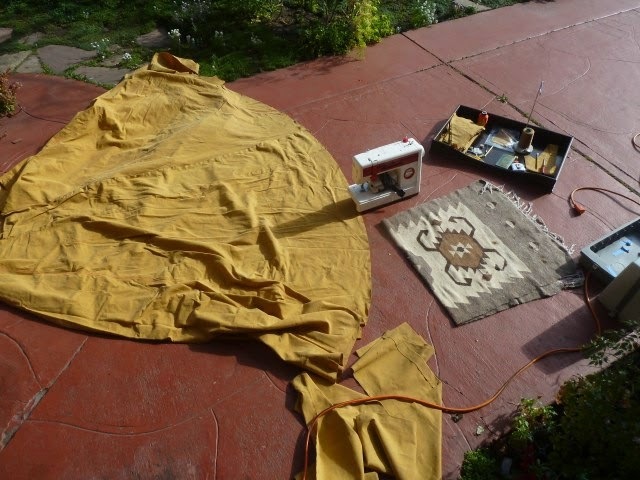 The other thing I learned from the ten foot yurt was to soak the canvas in water and let it dry to shrink it before cutting and sewing it. Shrinkage was mostly along the length of the canvas with very little across the width so trying to get a good fit without pre-shrinking the canvas would have been a challenge. 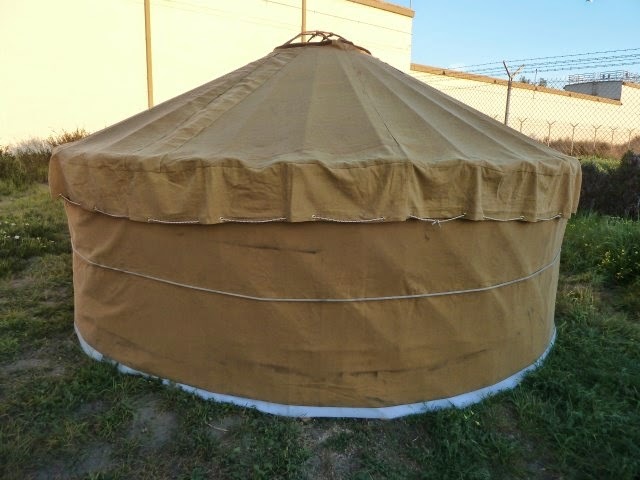 This photo is of the trial assembly of the yurt in back of the shop. Looks good enough. 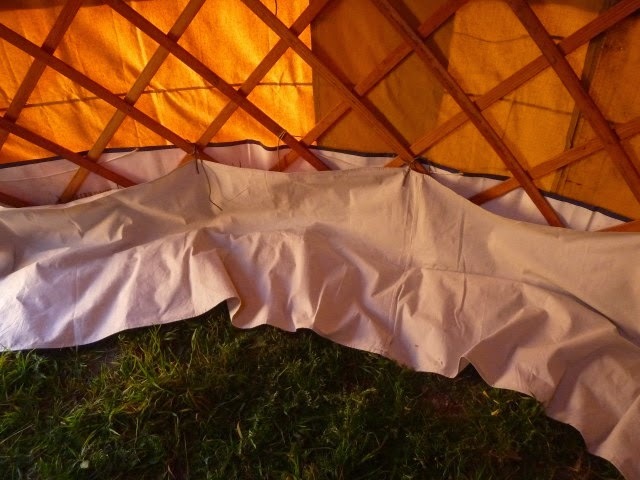 What you are looking at here is the extension of the wall canvas joined to the existing wall canvas from the ten foot yurt. 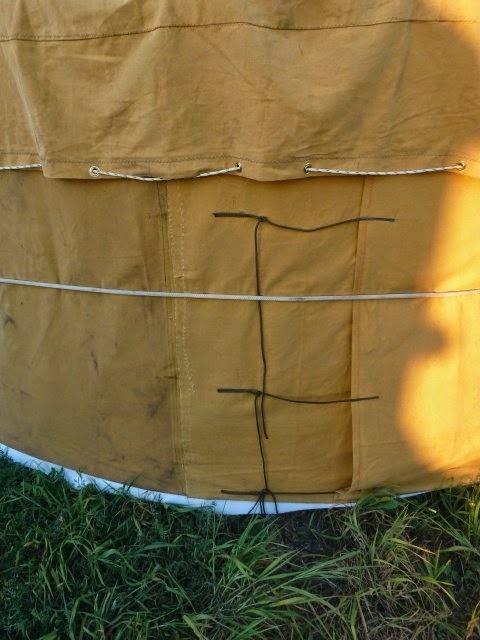 I also decided to add a skirt to the interior of the yurt to minimize the amount of sand blowing into the yurt in windy weather. And this is the tono or roof ring. I made the roof poles a little over long so minor changes in length wouldn't have them pulling out of their sockets. Here's the twelve foot yurt pitched in front of the original 16 foot yurt. Note the difference in roof pitch. I wanted to experiment with a lower pitch on the twelve footer to keep interior volume down for easier heating. The new pitch was 30 degrees vs. about 39 degrees for the 16 footer. A lower roof also makes for easier setup of the roof. I also decided to make a door frame for the door cover, an upgrade from a simple flap that hung over the door but was a nuisance to go in and out of. The assembly of the parts is tongue and groove for reasonable stability combined with ease of disassembly. 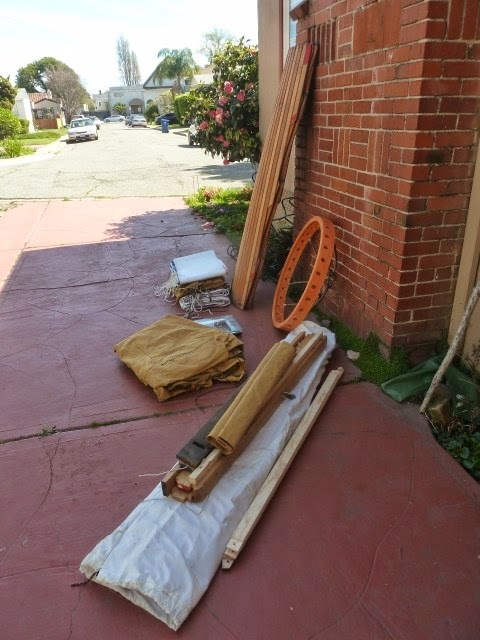 Once I was done, I dragged all the yurt parts outside to weigh them. Total weight about 198 pounds. Not suitable for backpacking but OK for car camping. 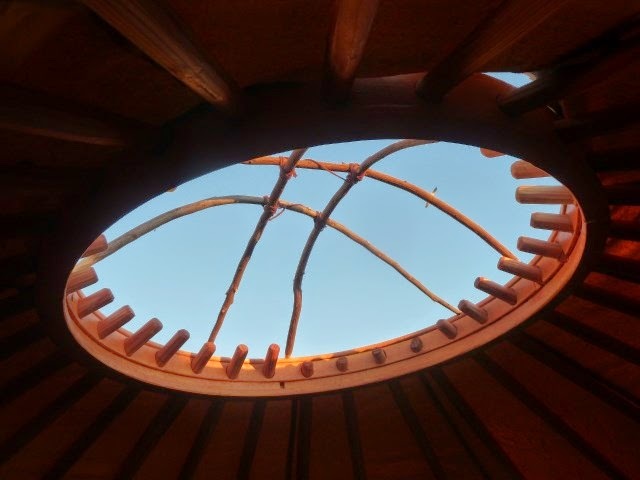 And here, the yurt deployed in the Mojave National preserve. We wanted an open roof for star viewing at night but rigged a table cloth for shade during the day.